Today after checking a few camera's we ( Beeman and I ) decided to check out the new gongs I picked up of Mucko ( Top Man) from the Mount. The new ones are Biz 400 and one plate is 12 x12 inch the rounds are 3.5 inch and 7 inch. Beeman has tried his new sako Carbon light 260 out to 500 yards and has mastered that range well so today was to try 500, 600, 700yds. Conditions weren't the greats with head winds gusting from 6-8 mph with a few stronger gusts around the 10 mph mark. Beeman's Swaro has the colour/ range adjusters out to 500 yards then he has to add on mil clicks out to the further distances which is what we wanted to check to make sure the drop charts were correct. 500 yards resulted in hits in the top of orange aim point but a fraction left. We moved to the 600yard mark and Beeman's first shot was left and slightly lower the second short missed the plate. 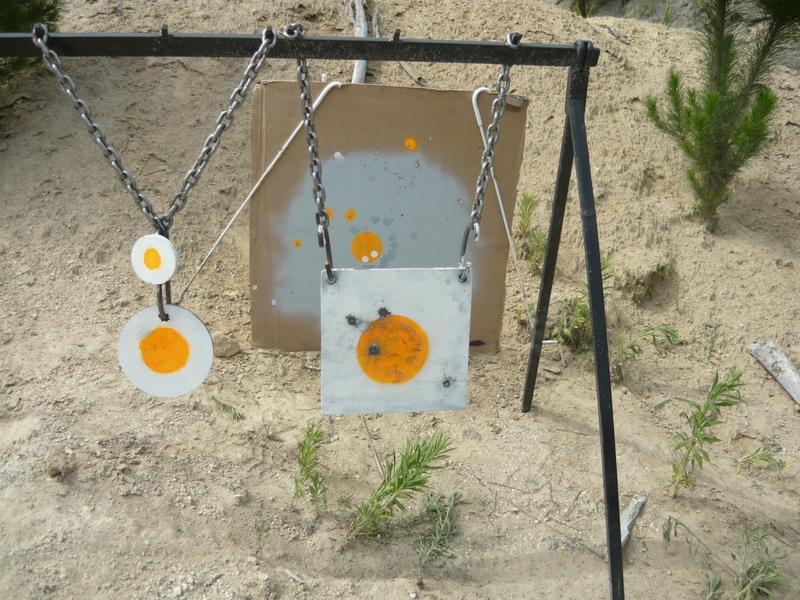 Onto 700 yards and a further two shots printed high and right on the plate about 2 inches apart, pretty damn good for his first shots at over 500 yards. 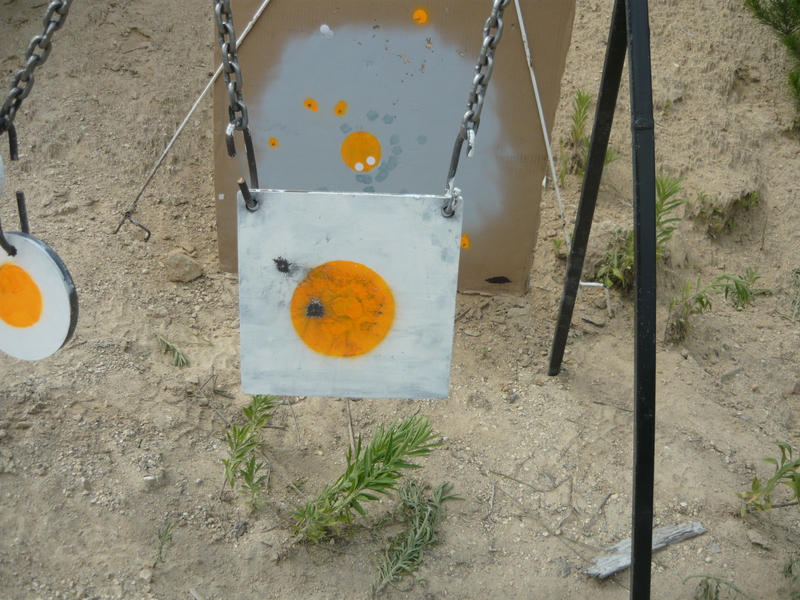 I had mixed results, the sand bag rest wasn't comfortable so I switched to my K Zone rest and shot much better . 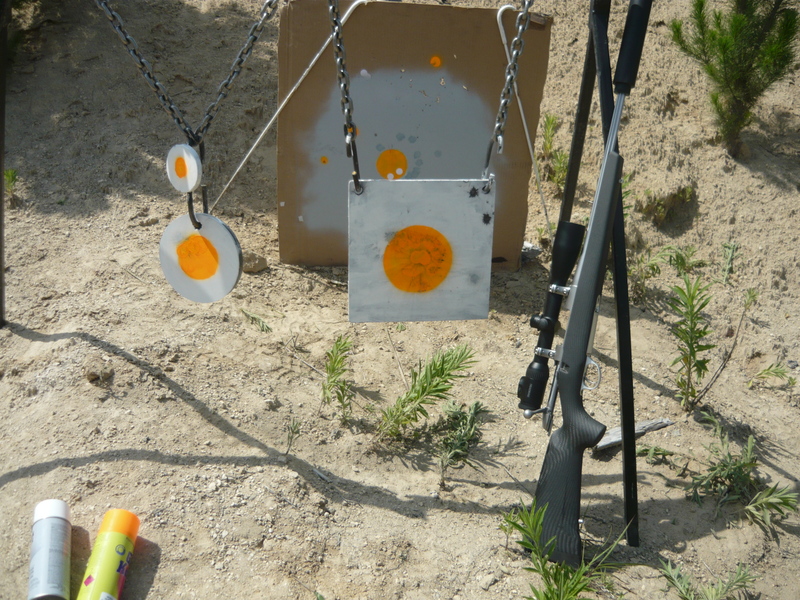 First picture the sako and Beeman's two shots at 700 yards, next picture is my 300 win Mag at 700 yards and the last is the 300 Win Mag and 7 mm Mag. We had a board up behind the plate to see where the misses went and it was only a few that would have missed a deer at those ranges. Another important thing was a couple of the shots that we called as not so good were where we said they would be which means we new when it not a good shot. Well we can still improve on our shooting but certainly in good conditions a deer will be rather unsafe if we do our part. Thanks again Mucko for the steel, it works a treat, no big dents in these plates. If you need Steel plates (Biz 400) have a talk to Mucko here on the forum he will help you out. mucko, Double Shot, Boaraxa and 3 others like this. Glad your happy with them @Mooseman pleasure meeting you and your awesome wife and sally lovely little dog. Like wise mucko, they work well, hope you enjoy your venison and home brewed cinnamon whisky, will catch you later. mucko, Gibo and BeeMan like this. Anywhere in Wellington I can get hvy steel gongs made or buy at a sane price?